Trenčín (TRENCH-een) was one of the neatest little discoveries I ever made in my travels (this was true when I originally wrote this blog post in 2001 and remains true as of the 2017 update). 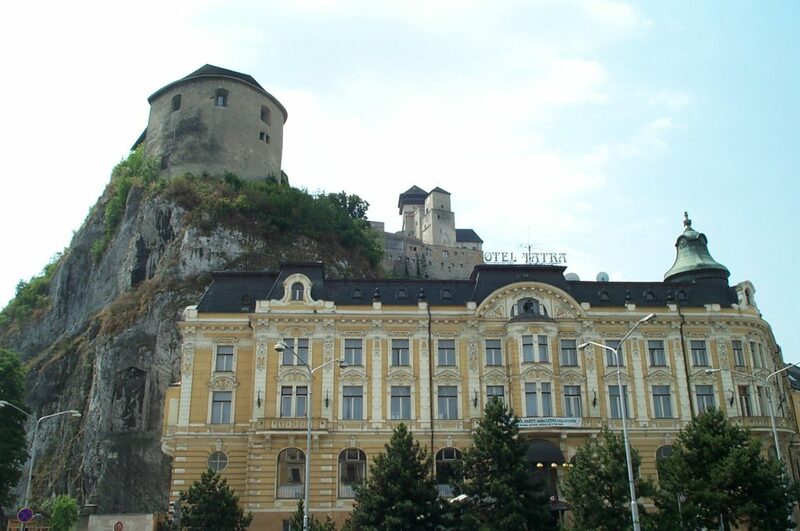 This pristine little Slovakian town is like a mini-Heidelberg, with a large active main square filled with shopping and eating, and a massive castle overlooking from a precipitous cliff. Located just a short 80 miles from the Slovak capital, Trenčín is a perfect day excursion for anyone visiting Bratislava. 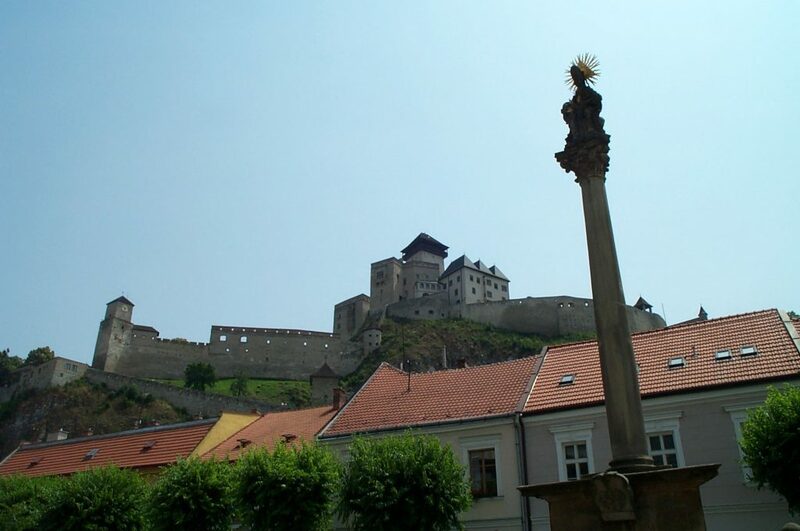 The huge main attraction is the Trenčíansky hrad, shown above. This castle is clearly visible from nearly every point in the city. 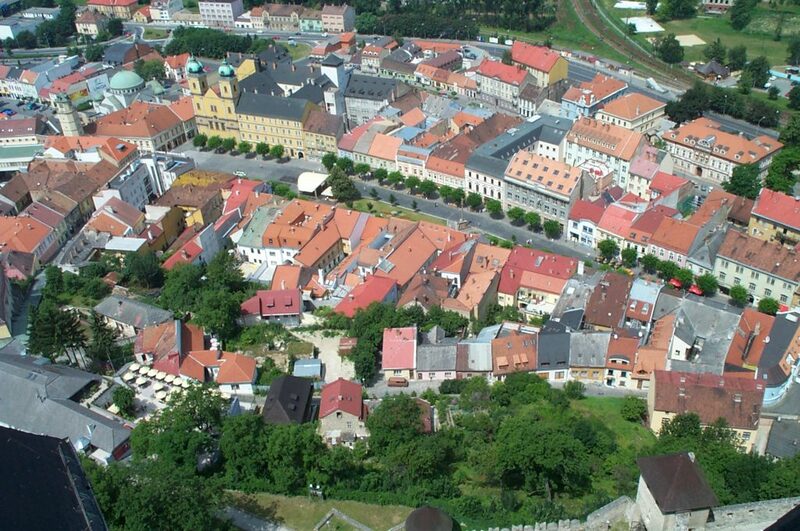 This castle was built on top of a Moravian courtyard somewhere around the 11th century. It was used in the 17th and 18th century as a military garrison while the town fought the invading Turks, but it burned down in 1790, and has been under restoration ever since. 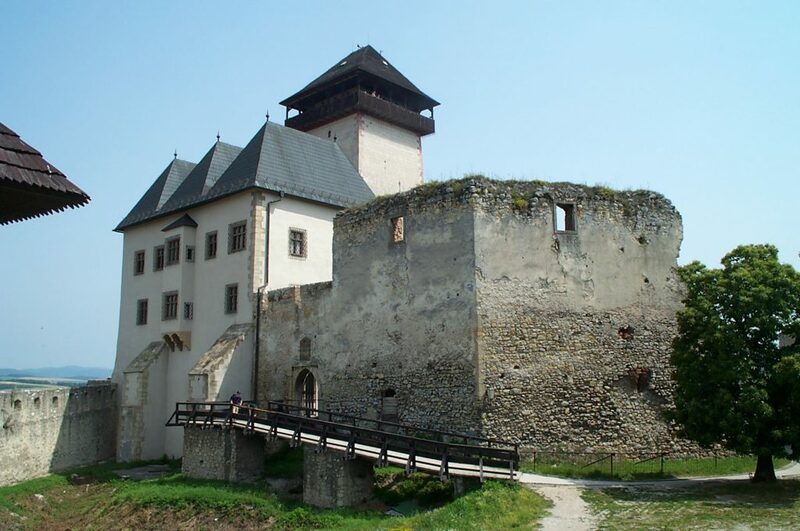 The Castle is now a museum and tourist attraction, providing superb exhibits of Slovakian history and culture in the L’udovits (LYOO-duh-vitz) Palace (pictured below). The exhibits inside here include expositions of medieval weapons and Slovakian heraldry (where one can recognize a number of Germanic and Slavic names that once ruled over the region). Also, the site has exhibitions on medieval tortune in the King’s Dungeon Tower, and several impressive art galleries. Professional falconers had an exhibit near the castle grounds’ entrance hall, and their birds were on display continuously at the northeast wall. At the top of the palace is a marvelous observation deck, where you can get a gorgeous view of the town (such as the below). This is the northern half of the main marketplace. You can also get great views of the Mestský Stadion, the public swimming area, and the industrial center to the far north. But, the marketplace is where all the action is. In 2001, before the EuroZone, everything was unbelievably cheap — I suppose that might have changed a little. Available were top Slovakian brand-name beers for only 19 crowns for a half-liter (40 US cents), and Slovak beers were very much like their Czech counterparts just to the west. I was also able to get streetside gelato (Italian style handmade ice cream) at the jaw-dropping rate of 4 US cents per scoop, plus 1 cent for the cone. And it was better quality than some of the gelato I had in Italy at 2 Euro a scoop. 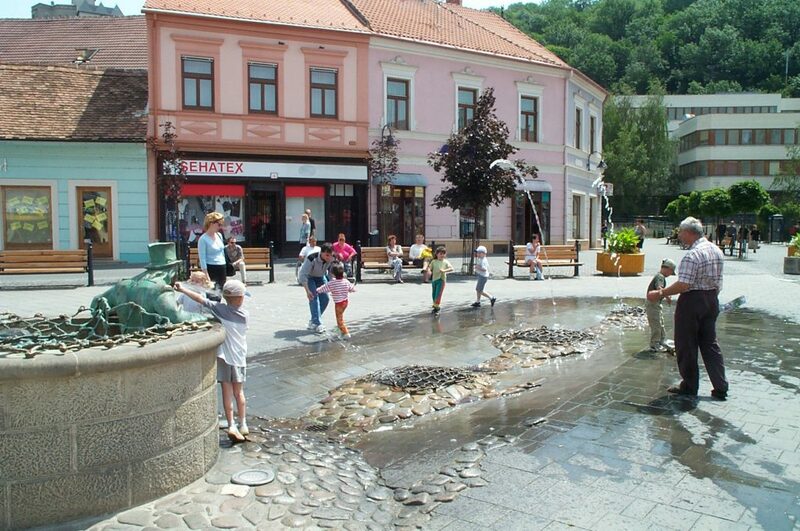 Like many Slovakian towns, Trenčín is quiet — you won’t be elbow-to-elbow people here — but there were quite a number of locals about enjoying the sunshine, such as those around this unusually elaborate fountain below. Trenčín’s shopping was really good — a number of brand names are available at low prices in their stores. The town still has the look and the feel of its roots, within its old churches, towers, and streets. Visitors can easily spend a leisurely in Trenčín, possibly more depending on how fast a climber they are (unfortunately, those with physical limitations were not well accommodated for the climb to the Castle, it required a pretty steep climb by foot — hopefully that has changed by now). 2017 addendum: I continue to see Trenčín as one of my favorite visits, in part because it was the first real opportunity to go to a former Communist country as a tourist (rather than being stationed or deployed) and seeing the local citizens just going about their daily affairs. If you were to look up the city on Google Maps and go to sidewalk view, you would quickly see how much the city has changed. For example, the fountain in the fourth photo is still there but the surrounding area is considerably more built-up and the pedestrian zone is vastly modernized. I leave it to more recent visitors to judge what else has changed, but it still looks like a great place to go.